If you are looking for a herb to add some colour to the garden then Oregano Country Cream could be the one. 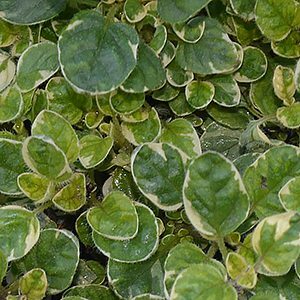 Used as a culinary herb, Oregano vulgare ‘Country Cream’ also works as a ground cover plant. With a natural bushy habit and attractive green and cream foliage, this is an attractive plant with aromatic foliage. Small pink flowers appear from late spring through summer and will attract bees to the garden. This is an easy care herb that is equally at home when grown in a container. The leaves can be picked and used in any recipe that require Oregano. Once established Oregano vulgare ‘Country Cream’ requires very little care. It will benefit from annual pruning to promote a more busy habit as well as more flowers. Planted in a sunny position in a well drained soil, after the first summer little extra watering will be required. A little well rotted compost around the plant each year and the occasional application of a liquid seaweed fertiliser will keep the plant looking great. You could grow this colourful foliage plant in a container to underplant a taller plant, perhaps a fruit tree.